Presenting the year 1989 as seen from the eyes of the storm. Remember where we started? And how she changed my life and how she made it end. Some velvet morning when we’re straight? So who were the gifted ones? The sensual stars of our wildest dreams? We sampled everything that moved – so long as it moved in the right circles. Black Riot was caught in the fire of Rob Base’s ‘cross-over’ – Technotronic bowed to Todd Terry – the Italians played the piano – rappers got dirtier, so more people listened – new voices were heard – Adeva really sings – some never sang – but they looked as if they didn’t ever need to – James Brown got confused with a woman’s pleasure over and over ‘Ow! Ow! !’ Remember that night? This album is the end of the beginning – we can only grow – faster, deeper, sexier! Good to hear these things again – they’ve been scattered on the fields away from home where they don’t belong. You fingered the sleeves of ‘those’ compilations and they got dirty. 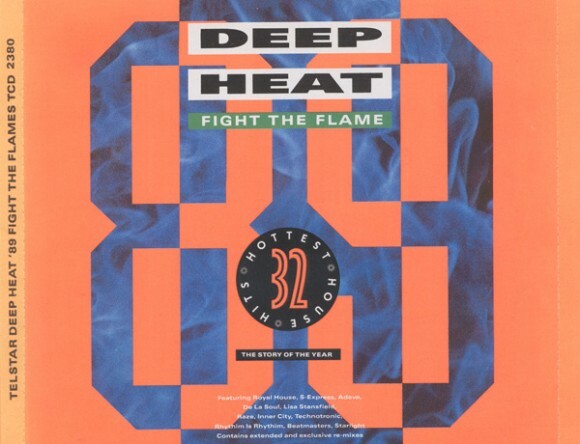 ‘Deep Heat’ was always too hot to touch for longer that it takes to enjoy the flame. So we did it all over again, but we added some new flesh to old bones – check side 4 – you’ll grow to love Kimiesha Holmes – and the warm feeling Mac Thornhill gives is just the start of ‘The First Touch’. Soul found it’s way back home and the fusion of heritage and future fell in love. 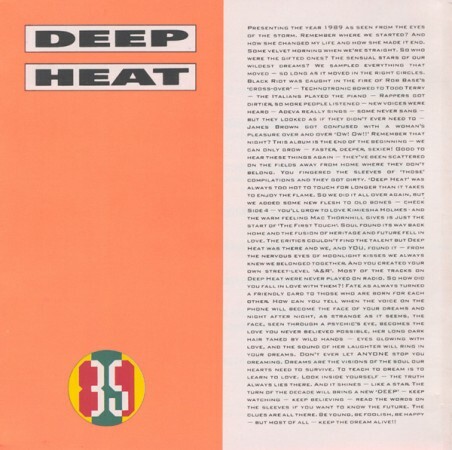 The critics couldn’t find the talent but Deep Heat was there and we, and YOU, found it – from the nervous eyes of moonlight kisses we always knew we belonged together, and you created your own street-level ‘A&R’. 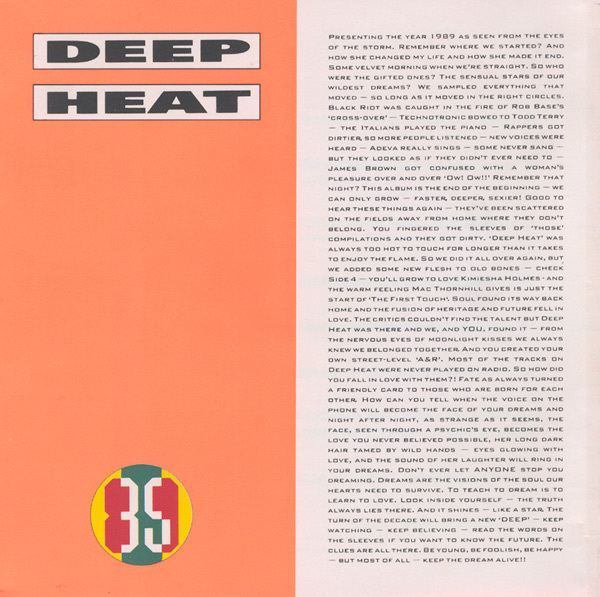 Most of the tracks on Deep Heat were never played on the radio. So how did you fall in love with them? Fate as always turned a friendly card to those who are born for each other. How can you tell when the voice on the phone will become the face of your dreams and night after night, as strange as it seems, the face, seen through a psychic’s eye, becomes the love you never believed possible, her long dark hair tamed by wild hands – eyes glowing with love, and the sound of her laughter will ring in your dreams. Don’t let ANYONE stop you dreaming. Dreams are the visions of the soul our hearts need to survive. To teach to dream is to learn to love. Look inside yourself – the truth always lies there. And it shines – like a star. The turn of the decade will bring a new ‘DEEP’ – keep watching – keep believing – read those words on the sleeves if you want to know the future. The clues are all there. Be young, be foolish, be happy – but most of all – keep the dream alive!! Picked this up in a charity shop the other day, contains some real classics, although side 4’s new tracks are a pretty motley collection, Strings of Life obviously aside… Also as a 15 year old bedroom raver in 1989 i’m pretty certain most of these were played on the radio, given that there’s probably a dozen top ten hits there at least? I was going to say “Shouldn’t this all be in caps?” but I see it IS. Sadly I did not write it. @sam walton. Haw haw, I long ago sold my oasis cds, so I’d forgotten that ‘Morning Glory’ liner notes reverie. Priceless. I liked Morning Glory at the time, but was in the US so was only vaguely aware of the UK hysteria – the liner notes imparted that vibe to those far away more or less full strength. Hilarious but useful I suppose. Technotronic bows to no one! we should have regular deep heat polls!